Converseen is an open source image converter and resizer written in C++ with the powerful Qt4 libraries. Thanks to the Magick++ image libraries it supports more than 100 image formats like DPX, EXR, GIF, JPEG, JPEG-2000, PhotoCD, PNG, Postscript, SVG, and TIFF and many others. 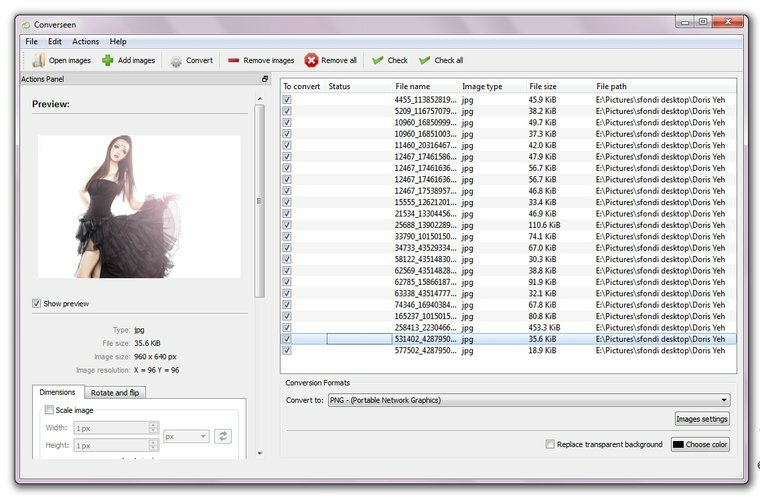 Converseen allows you to convert, resize, rotate and flip automatically an unlimited number of images. With Converseen you can save your time because it can process more than one image with one mouse click. The software works perfectly. Despite the last commens, the program today doesn't contain any kind of third party software during the installation so, now it's perfectly clean. Program itself is decent, but I won't score it better than 1 until the malware is removed. agreed, the installer in phone home spyware. Worthless piece of junk: free is far to expensive for this malware. Official install is still full of malware. Despite the app itself being decent, it won't score above a 1 anymore from me until the malware/foistware is gone. The "downloader" installer was full of crap. It offered me Counduit/Search Protect, nSavings Coupons, Desktop Weather Alerts, Highlite App, and Shopop Ads. The downloader was flagged as malware by both Avast (on my PC) and Norton 360 (which I still happened to have in the test VM from a review last month). The program itself is alright though. Rating of 2 purely for the malware bundled with the official download. No thanks I have to pass even though it looked nice in the picture. Rating relates to the attached and/or embedded malware only and not the quality of the product itself.